One of the problems ornamental crop producers face when they contend with the current drought is that reduced water use can affect crop quality and yields by increasing soil salinity. It is important for growers to know how irrigation water quality affects plant growth, and how they can mitigate the impact of salinity on their crops through judicious management of irrigation water quantity. Soil salinity results from the accumulation of salts from several sources, but the most important ones are irrigation water, fertilizers and soil amendments (particularly animal manure and some composted organic matter). Growers concerned about salinity should be aware of the contributions to salinity that come from the fertilizers and soil amendments they apply, but those are topics beyond the scope of this article. Most irrigation water, especially from wells, contains salts that it picks up from the rock, soil and organic matter it comes in contact with. The salinity of naturally occurring waters in California varies widely, but it tends to be relatively high along California’s south and central coasts, where most ornamental crop production occurs. The salts dissolved in irrigation water ionize to form positively charged cations and negatively charged anions. Six ionized constituents normally are responsible for nearly all of the salinity of irrigation water. Of these six, three are cations: calcium, magnesium and sodium. The other three are anions: bicarbonate, chloride and sulfate. Salinity in water and soil is usually measured by electrical conductivity. A water's ability to conduct an electrical current is directly related to the concentration of salts present in solution—the saltier the water, the better it conducts electrical current. Electrical conductivity is usually reported in decisiemens per meter (dS/m). Water electrical conductivity is often abbreviated ECw. This value is important for managing salinity, but it doesn’t indicate the true salinity to which plant roots are exposed. A more direct value is obtained by saturating soil samples with distilled water, then extracting some of the soil solution and measuring its electrical conductivity. This saturated soil extract electrical conductivity is abbreviated ECe. Typically, crop salinity tolerance is expressed in relation to ECe. As the salinity of the soil solution increases, plant water uptake becomes more difficult. In effect, a high salt concentration in the soil solution reduces the amount of water that is available to the plant. Therefore plants in saline soil must devote more of their energy to taking up water, instead of using that energy for growth. That’s why yields tend to decrease when soil salinity is high. Growers who use irrigation water of marginal quality must take steps to avoid negative effects on crops (see fig. 1). One possibility is to treat water (usually by deionization or reverse osmosis) to improve its quality, but this approach is expensive. A practical alternative for many growers is to develop an effective leaching program to prevent excessive accumulation of salts in the root zone. Leaching is best achieved on ornamental crops by applying the proper leaching fraction.  This is the ratio of the volume of water leached below the root zone (for example, the water that runs out of the bottom of a pot) to the volume of water applied (for example, the total amount of water applied to a pot). Fig. 1. Salinity must be managed to avoid negative effects on crops. 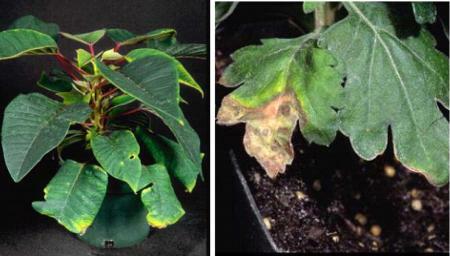 Here, marginal chlorosis and necrosis of the lower foliage of poinsettia (left) and necrosis of the lower foliage of chrysanthemum (right) are a result of high salinity in irrigation water. However, salinity effects are not always accompanied by visible symptoms. Often, yield reduction is the major problem, and no other symptoms are apparent. Photos: J.K. Clark. The proper leaching fraction is calculated by dividing ECw by the maximum tolerable EC of the soil solution that has passed through the root zone (which I will call ECleachate). ECw, for our purposes, should be measured downstream from fertilizer injectors. Growers can measure ECleachate directly by capturing the initial leachate from a pot after irrigation and measuring its EC. Tolerable ECleachate values have not been determined for ornamental crops, but most ornamentals can tolerate ECleachate values between 6 to 9 dS/m. The target ECleached should be about 3 dS/m) for salt-sensitive species. I have done the math for you in table 1, which presents target leaching fractions in relation to ECw and ECleachate. Table 1. Recommended leaching fractions. The leaching fraction is used to calculate the amount of irrigation water that must be added to achieve leaching of salts in addition to replacing evapotranspiration. 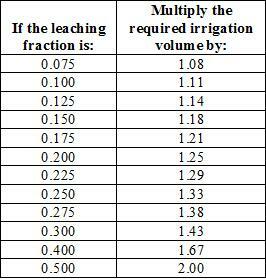 The values for leaching fraction can be rounded off to conform to the values in table 2, which provides the multiplier for adjusting irrigation volumes to achieve leaching. For example, a block of plant that requires 100 gallons of irrigation water to replace what was lost to evapotranspiration should be irrigated with 143 gallons of water if the ECw is 2 dS/m and the desired ECleached is 6 dS/m (the leaching fraction is 0.33, rounded off to 0.30). In other words, for every 100 gallons of water use by the crop, salinity will “use” an additional 43 gallons. Table 2. Factor to multiply irrigation volume by to meet leaching requirement. The effectiveness of leaching should be monitored periodically by measuring ECleachate to ensure that it is near the target value. To do this, select plants to test just before irrigation is scheduled. Add enough water to each pot to cause a small amount of leaching, capture the leachate and measure its EC. If ECleachate is higher than the target value, the leaching fraction may need to be increased; if ECleachate is lower than the target, it may be possible to reduce the leaching fraction. It is also worthwhile to test the soil ECe, or have it tested periodically by a commercial lab. There is no salinity problem for plants when ECe is below 2 dS/m. Salt-sensitive species are likely to have reduced growth when ECe exceeds 2 dS/m, and most other crops will experience growth reductions when ECe exceeds 4 dS/m. Table 2 also indicates indirectly how much the irrigation water quality and crop salinity tolerance can affect total water use. If ECw were 1 dS/m in the example given in the preceding paragraph, the leaching fraction would be 0.17 and about 120 gallons would be required to manage salinity and replace 100 gallons of crop water use (extrapolating from the table where a leaching fraction of 0.175 has a factor of 1.21). That is a 16% savings in water use. Growers rarely have the luxury of switching water sources. However, it may be feasible to replace some crops with more salt-tolerant species. In the first example above, switching to a crop that could tolerate an ECleached of 9 dS/m would change the leaching fraction from 0.33 to 0.22. This would decrease the total volume applied in that example from 143 gallons to 129 gallons, a savings of 10%. In situations where irrigation blocks contain a mixture of plant species, growers can save water by grouping salt-sensitive plants separately in a block so that these plants don’t dictate the amount of water applied to more salt-tolerant species. All of these recommendations should be tempered by observations of crop performance in relation to soil salinity. Growers who monitor and record soil salinity and leaching fractions, and who relate those values to crop growth, will be able to tweak the leaching practices as needed to keep water use efficiency as high as possible. Richard Evans is UC Cooperative Extension Environmental Horticulturist, Department of Plant Sciences, UC Davis.